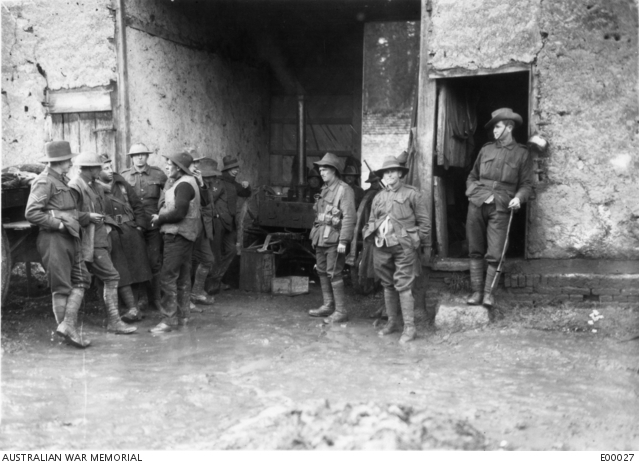 Members of the 2nd Battalion around their billet whilst out resting at Flesselles. Identified, left to right: 2482 Corporal (Cpl) (now Lieutenant) C. H. Todd MM; unidentified; 4140 Private (Pte) H. A. Burgess; 4571 Cpl E. J. Robinson; 1373 Pte T. Keevil; 1583 Pte C. H. Lewis (partially obscured, smoking a cigarette); unidentified; 2250 Pte E. C. C. Titterton (resting left arm on wheel); 458A Pte F. H. Maher; unidentified (obscured by Maher); unidentified; 5079 Pte C. Fetherstone; 4143 Pte J. A. Burke (standing just outside doorway).